Restored country house, with two outbuildings and various annexes, surrounded by 4.3 hectares of private land, with 6.000 sq.m garden and football pitch. Total surface area of 637 sq.m, with living area, 9 bedrooms and 10 bathrooms. 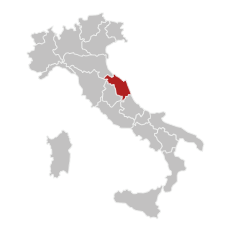 Casale Piceno is situated in a hilly location overlooking the pretty countryside of Le Marche, just 8 km from the sea. The property comprises the main house and two outbuildings, surrounded by over 4 hectares of private land with a 6.000 sq.m garden and football pitch. The nearest town for day to day purchases and requirements is Potenza Picena, just 3 km away, while the sea is only 8 km away. 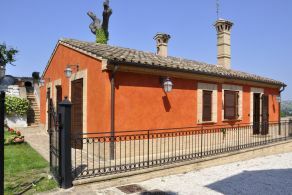 The area is peaceful and easy to reach, with Recanati (8 km), Porto Recanati (10 km) and Civitanova Marche (14 km) 10 minutes’ drive away and Macerata (17 km), a university town, just 20 minutes away. The nearest airport is Ancona (36 km) which can be reached in just over half an hour by car thanks to the connection with the A14 motorway (10km), while Rimini (127 km) and Pescara (144km) airports are around an hour and a half away. With two floors above ground and a basement floor, for a total surface area of 376 sq.m. 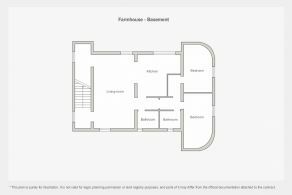 The ground floor, slightly raised from the garden, hosts the living area, comprising the hall, living room with fireplace, kitchen, bathroom, a store cupboard and a space for the central heating, with its own entrance. On the first floor there is the sleeping area, with three bedrooms with en-suite bathrooms. 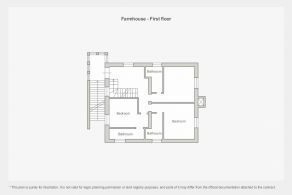 This floor can be accessed both from inside and out, via a covered staircase with a small porch, typical of old farmhouses in Le Marche. 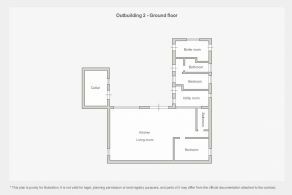 The basement floor has been converted into a separate apartment, with living room, kitchen, two bedrooms, two bathrooms and a store cupboard. Situated next to the main house, with a total surface area of around 95 sq.m and comprises kitchen/living room, two bedrooms and two bathrooms. 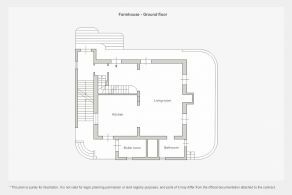 The main house features roof trusses in oak and parquet floors, also in oak; a travertine marble staircase with wrought-iron balustrade which connects the first and second floors, exposed brick arches and inlays in the floors which refine and enhance the look of the house. The window fittings are mahogany with double glazing. In the basement apartment, the floors are tiled. In the living room, which connects to the kitchen through a pointed archway with exposed brickwork, there is a large fireplace, also featuring exposed brickwork. The kitchen is light and airy, thanks to two large stained-glass windows with wooden fittings. 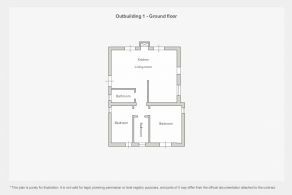 The first outbuilding also features oak roof trusses and tiled floors in the living area, while the floors in the sleeping area are parquet, also in oak; the windows and French doors are wood with double glazing. The property is accessed via an impressive wrought-iron gate with two large brick columns at the end of a long, hedge-lined driveway. From the large car park, a brick staircase leads to the main house, which is surrounded by an outdoor area of around 300 sq.m, paved in brick, with a circular flowerbed in the middle. 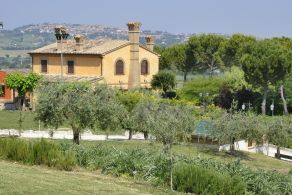 The garden, all 6000 sq.m of it, is a network of gravel pathways, surrounded by hedges and interspersed with pine, olive and other local trees. Outdoor ornaments such as low walls, fountains, pots and benches make this a relaxing, peaceful environment. Behind the buildings there is a large football pitch. 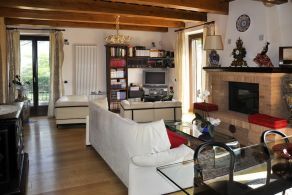 Casale Piceno would be ideal as a main residence or as a holiday home. The three separate living spaces also make the property ideal tourist accommodation, with one part for living in while renting out the others.